What an eventful week! So much to say, but never enough time. It was a wonderful week. We started off with zone conference, which is always an uplifting and inspiring experience. We talked a lot about baptism, and why baptism is so important. For a powerful personal study, study the connections between the Atonement of Jesus Christ and the ordinances of baptism and confirmation. That night, after zone conference, we found out from Hna. Arriola that Olga, who Elder Frey and I had taught and was baptized just two months ago, had passed away unexpectedly due to a pneumonia. I was saddened by the news, and especially for her family, but at the same time, I was so happy that she had had the chance to be baptized before she returned to her heavenly home. I am confident that she completed her earthly mission honorably, and that she is now resting in paradise with other righteous spirits. What a wonderful woman she was, so sweet, caring, and genuine. 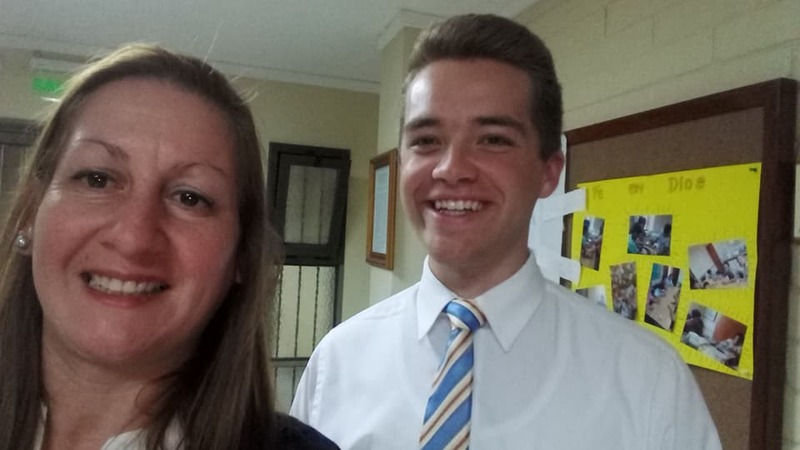 I will always be grateful for the opportunity I had to know her, even if only for a short few months, and for what she taught me, and the privilege it was for me to teach her a little more about her Savior. On Wednesday, we had the chance to pass by as they held a viewing, and we visited with her daughter and grandson, who also are investigators. We had a chance to share a brief moment with them and testify of God's plan for us. During this experience, the Spirit reaffirmed and strengthened my testimony that God has a plan for every one of us, and that we are not here by coincidence. Our loving Heavenly Father knows us, and loves us, and wants us to return to Him. I feel to say as Jacob said, O how great the plan of our God! Truly he loves us. On Friday, we had a unique opportunity to go with the elders in La Bianca to Chajari, a city to the north of Concordia, where the Church currently does not exist. We went with the purpose of gathering information and creating a report to present to Presidente Perez so that he and Elder Levrino can evaluate if Chajari is ready to receive missionaries and an organized group. How cool is that?! There is currently one member family living in Chajari, Familia Ventura, along with another brother, Hno. Conforti, who lives with his family, who are not members. We visited them, along with a handful of referrals that we had received over time for Chajari that had never been visited because there are no missionaries there. It was a great experience. Hno. Ventura accompanied me and Elder House, one of the La Bianca elders the whole morning, showing us around Chajari. 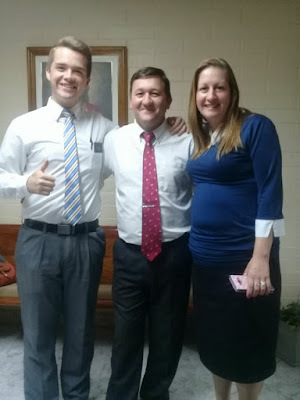 As we visited with him, and later with his wife and children, I realized that it would be rather difficult to find a more converted family in the Church. Hno Ventura is about 35 years old, is from Montevideo Uruguay, and his father is a former mission president of Mision Rosario and former temple president of the Montevideo temple, and currently serving as an Area historian for the church. He served a mission in Mendoza, and recently finished an MBA at BYU. He and his wife and children lived in Wymount for two years while he studied at BYU. They all speak English after having lived in the US for more than two years, so of course we talked a little bit in English. :) Just a few months ago, moved back to Chajari, where the family of Hna. Ventura lives. The interesting part of the story is that they were praying and fasting to know where to go. They had gone to Montevideo, but decided not to stay. They had gone to live in Chajari temporarily while Hno. Ventura looked for work in Buenos Aires. A few days after they arrived, Hna. Ventura's mother was killed in a motorcycle accident, and they were left with her store that she had had. They tried to sell it, but nobody would buy it, so they decided to start running the store themselves. As I talked with the hermano that morning, he told me, I don't really know why we are here. But it would seem to me like the Lord needs us here for some reason. I could sense the faith he had in the Lord and in His plan. How interesting it will be if we end up putting missionaries in Chajari! Another testimony to me that God is conscious of all of His children and works through those who are willing to follow the promptings He gives them to bring about His marvelous work. I have no time left, but to finish off the week, we had an incredibly inspiring and Spirit-filled General Conference. What a blessing it is that we have prophets, seers, and revelators who speak for God today! I want to bear my personal testimony that I know beyond a shadow of a doubt that when we act on the words of the prophet and apostles, the promised blessings come. May we each follow more closely and diligently all of the inspired counsel we have received from the prophets and apostles, that we may also be instruments in God's hands. This is the work of God, and this is His Church, and we are His children. With Elder House in Chajari!